It is not unusual for defendants to accuse the police of planting drugs, but rarely does evidence exist to support the accusation. In this case, however, the footage provides ground for heightened suspicion. Though not conclusive, the recordings were problematic enough that prosecutors abruptly dropped the marijuana charge while one of the officers was in the middle of testifying at a pretrial hearing. He and his partner searched the BMW. Officer Pastran searched the back-seat area and announced he had found nothing. Officer Erickson, whose camera turned off in the middle of the search, looked in the back seat and apparently found nothing. After several minutes, Mr. Kuyateh, the driver, shouted that Officer Erickson had put something in his car. He was arrested on the charge of obstructing the police investigation. 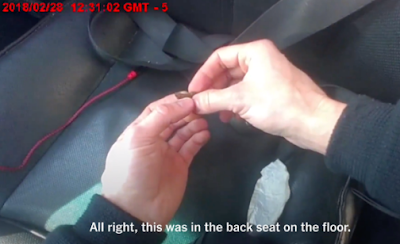 Officer Erickson then said he had discovered a marijuana cigarette, which he claimed had been burning on the floor behind the driver’s seat. It was in the same general area Officer Pastran had already searched, leading him to declare, “looks pretty clear.” Officer Erickson’s camera turned back on just before he made the discovery.